I recently volunteered to bake my friend Jody a cake for her upcoming 30th birthday. I thought that, following the colossal disaster that was Emma and Andy's engagement cake, for which I profusely apologise and remain a little embarrassed about (I KNOW I can do better! Especially now...), that I should probably practice my cake decorating skills. Note that this entry is divided into two parts - the baking of the cake, and the decorating of the cake - because I made two smaller cakes so that I could try different decorating techniquies. Here's Emma and Andy's cake. It's not awful but it's very amateurish and not at all the standard I would personally want at my own engagement party. Sorry, guys. Not my finest moment! I have several things to say in my defence, though. 1) I got off a plane from Adelaide at 9pm the night before the engagement party. Knowing that the cake would take several hours to cool on account of both the density and size of the cake as well as the fact we were in the middle of a heatwave, I decided to bake the cake as soon as I got home from the airport. I started mixing at about 10:30pm, got it in the oven at about 11:30pm (I must have been moving in slow motion because I was so exhausted) and set the alarm to get me up so that I could take the cake out of the oven. Waiting around for it wasn't an option because I was so tired I was shaking. 2) The tin was a larger than usual square one so that it could feed the requisite number of people, and I had to hazard a guess as to how long it would take. Luckily I underestimated and had set my alarm early, because the cake was, in my opinion, a little dry when I rescued it from the oven. I reckon it had something to do with the massive surface area but relatively shallow batter. 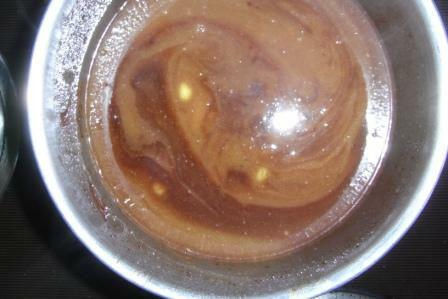 3) I hadn't used this particular recipe before. It's from Exclusively Food. 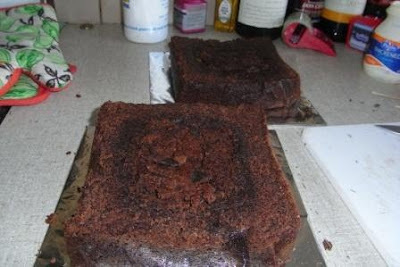 The cake tastes heavenly, by the way, but with the exception of this first time I cooked it, I have not succeded in producing a cake that did not fall in the middle. And I mean really fall in the middle. So really, this is a reverse excuse. I've made the cake four times now and the last three it's been delicious but ugly. But a multitude of sins can be fixed when a cake is dense and muddy and smothered in chocolate! 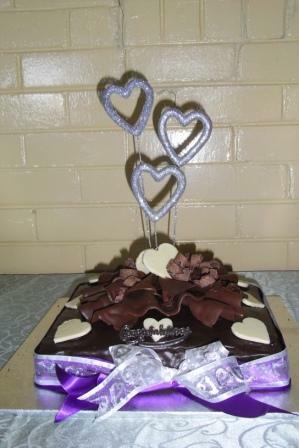 4) When it came to decorating, I had never actually worked with chocolate before. Ganache, yes. Chocolate, no. Emma requested chocolate curls, but, not being in posession of a marble slab, and not being either clear enough in the head or wise enough to have discovered Pioneer Woman and read her tutorial on chocolate curls (spread your melted chocolate on the reverse side of a frozen baking tray), I opted to make chocolate waves instead (made by spreading melted chocolate on wedges of baking paper and draping them over the handles of cooking utensils to dry). 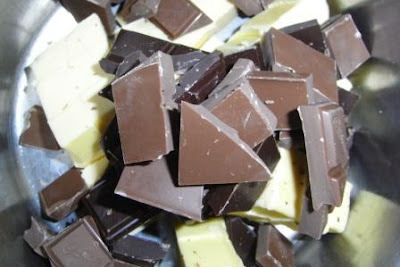 5) It was a stinking hot day, and our house lacks air conditioning, so all the chocolate I touched ended up with little smudgy fingerprints on it. Also, the cake was too big for the fridge and the chest freezer is in the bottom of the shed, so I couldn't very well run down there with each new chocolate wave - I had to make do with placing the waves all at once and then bringing the whole lot down to the freezer. Right. I think I'm done with the excuses. To the recipe! 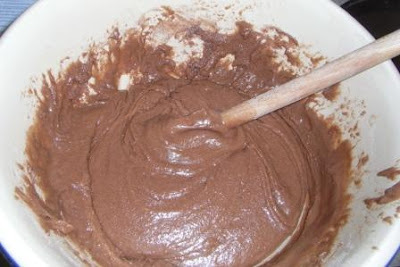 This is a very good way to start making a mud cake. And this is what happens when you apply heat and add the better part of a cup of coffee. This is the Axis of Delicious. Depending on whether you are watching your weight, this may also be known as the Axis of Evil. In here, there is 250g of chocolate (dark and milk), 250g butter, 1tsp instant coffee powder, 3.4c water, 2c+2tbsp plain flour, 1/4c+2tsp cocoa powder, 2 1/2c castor sugar, 4 large eggs, 2tbsp peanut oil, 1tsp vanilla extract, and 1/2c buttermilk (I used normal milk and a teensy bit of white vinegar). 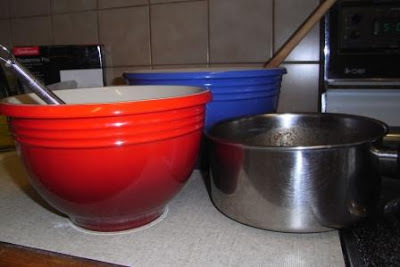 Please feel free to take the time to admire my very good looking Le Creuset mixing bowls. I know, we've established before that I'm a bit of a freak about things like this. Mix it all up (melt everything up to the coffee; cool. Sift dry ingredients into big bowl. 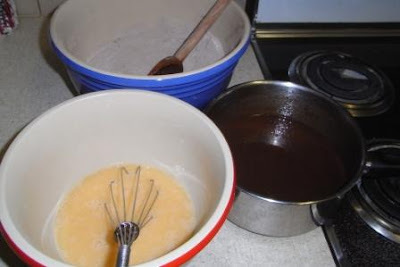 Mix wet ingredients in smaller bowl and add to dry ingredients in big bowl. 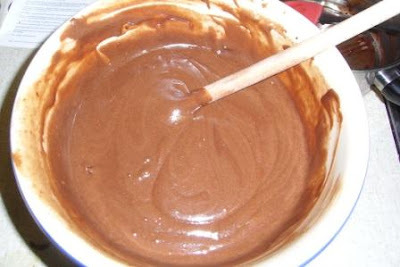 Add chocolate mixture in 3 batches and bake it in a deep 23-24cm greased and lined tin at 160oC for about an hour and 15 to an hour and 30). It looks good enough before you add the chocolate mixture... ...but this is what it looks like AFTERWARDS. Yummm. Then you bake it, and because you never seem to cook the recipe in the tin size specified, it sinks in the middle, badly, and so you have to cut the big rim off the top and fill the pothole in the middle with it. But it's a moist, dense cake, so it doesn't change the texture much. Stand by for my next post on decorating these suckers (the real reason behind the title of this post, because there's nothing in this particular entry that denotes that I am in fact That Good! Unless you count the fact that I cleaned up after myself immediately. In which case, yeah! I really AM That Good! ).